It is unbelievable, but since its theatrical release only two months ago, The Losers, will be debuting and coming to Blu-ray this July. Based on the comic book of the same name, The Losers is an explosive tale of double cross and revenge. "The Losers" centers upon the members of an elite U.S. Special Forces unit sent into the Bolivian jungle on a search and destroy mission. The team -- Clay, Jensen, Roque, Pooch, and Cougar -- find themselves the target of a lethal betrayal instigated from inside by a powerful enemy known only as Max. Presumed dead, the group makes plans to even the score when they are joined by the mysterious Aisha, a beautiful operative with her own agenda. Working together, they must remain deep undercover while tracking the heavily-guarded Max, a ruthless man bent on embroiling the world in a new, high-tech global war. Starring Jeffrey Dean Morgan (Watchmen, Supernatural), the up-and-coming Zoe Saldana (Avatar, Pirates of The Caribbean: Curse of The Black Pearl), Chris Evans (Fantastic Four, Push), Idris Elba (Takers), Columbus Short (Armored), Óscar Jaenada (Pirates of the Caribbean: On Stranger Tides), Jason Patric (The Lost Boys), and Holt McCallany (A Perfect Getaway) are simply amazing together; they provide the perfect chemistry needed for this type of film. Written by the amazing Peter Berg (Very Bad Things), the only weak link in the entire film is the director, Sylvain White (I'll Always Know What You Did Last Summer); it seems as if he is determined to make the film stylized although not needed. He uses quick scenes and cheesy cartoon layovers that causes this great film to be lacking. As with most of it's latest releases, Warner Bros Home Entertainment has gone all out with it's 1080p/VC-1 transfer. The only issue with it is the over-hyped color saturation which again is a result of Sylvain White trying to make the film have a more "comic book" stylized look. The Blu-ray also hosts an amazing DTS-HD Master Audio 5.1 surround track, that really packs a punch of for this kind of film; it allows you to hear and feel every explosion on screen. Like most Warner Bros releases, The Losers comes with a DVD and Digital Copy. It also includes: Zoe and the , Band of Buddies: Ops Training, Action-Style Storytelling, as well as a one-minute ending scene. If you are looking for a fun, action-packed "buddy" film for the evening, then The Losers is definitely for you. Hopefully, we can see more of this crazy bunch in the future. 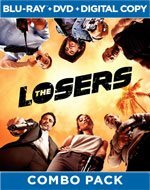 Download The Losers from the iTunes Store in Digial HD. For more information about The Losers visit the FlickDirect Movie Database.